Whey Protein Isolate (90% Protein), Natural & Artificial Flavor, Xanthan Gum, Sucralose, Acesulfame-K.
Whey Protein Isolate (90% Protein), Cocoa Powder, Natural & Artificial Flavor, Xanthan Gum, Salt, Sucralose, Acesulfame-K.
Whey Protein Isolate (90% Protein), Natural & Artificial Flavor, Xanthan Gum, Red Beet Powder, Sucralose, Acesulfame-K.
Add 1 level scoop (included) to 8 ounces of milk, water, juice or your favorite beverage. 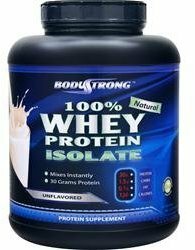 BodyStrong's 100% Whey Protein Isolate mixes instantly with just a spoon. It can also be added to cereal, oatmeal, yogurt, baked goods and sauces to increase their protein content. Take 1-4 servings a day. Add 1 level scoop to 8 ounces of milk, water, juice or your favorite beverage. BodyStrong's 100% Whey Protein Isolate mixes instantly with just a spoon. It can also be added to cereal, oatmeal, yogurt, baked goods and sauces to increase their protein content. Take 1-4 servings daily. BodyStrong’s 100% Whey Protein Isolate is an ultra-premium whey protein supplement that contains only whey protein isolates, which are 90% protein by weight. This translates into less fat and carbs when compared to other protein blends or simple whey concentrates. Each serving is rich in all the amino acids including BCAAs and glutamine peptides. Whey protein isolate is extremely fast absorbing and provides an excellent morning, pre/post workout or in between meal shake. BodyStrong's 100% Whey Protein Isolate contains only the purest, highest quality whey protein isolate to help you reach your health and fitness goals. Whey protein isolate is 90% protein by weight, making it low in carbs, low in fat and virtually lactose-free - and it delivers a whopping 27 grams of protein per scoop. It is cold processed, micro-filtered, and undenatured, to produce the most wholesome form of whey protein available. With only 1 net carbs and 1 gram of fat per serving, BodyStrong's 100% Whey Protein Isolate is perfect for dieters. It absorbs quickly to maximize muscle growth and repair without the heavy feeling associated with fat and carb rich meals. Best of all, it has a rich creamy taste you'll love.